111 Portfolio, a photo by mjm_nz on Flickr. For the final assignment for my Auteur study paper, we had to present a portfolio of 10 images in a style inspired by one of the photographers we studied during the course. 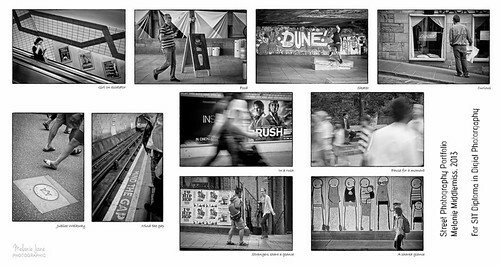 I chose a street photography style for my portfolio, inspired by the work of Henri Cartier-Bresson. I have drawn upon his approach of finding an interesting location and waiting for the right elements to align in the frame and the photograph to develop. I was particularly interested in capturing the signs and street art with the people around. I have not done a lot of street photography in the past, and so this was something new to me, but it is something I have really come to enjoy and will endeavor to continue to work on. “Rush” is absolutely on point!